The Competitive Intelligence Division (CID) of Special Libraries Association (SLA) has a great line-up of presentations and fun events at this year’s annual conference in Philadelphia from June 12-15. In the spirit of cooperative intelligence, I have listed the competitive intelligence (CI) events below in chronological order by date with book signings at the end. Look under Twitter #slacid for CI Division Tweets! How to Create the Advantage of Competitive Intelligence in Your Organization. Seena will share wisdom and highlights from her book, Competitive Intelligence Advantage. 10-11:30 a.m.: Convention Center 104B. Dr. Craig Fleisher: College of Coastal Georgia CI Division UnConference. Explore the future of competitive intelligence as we look to 2020. 2-3:30 p.m., Convention Center 109B. Toni Wilson: MarketSmart Research CI Best Practices for Creating Value & Collaboration. Show how to create collaboration between Information Professionals and other areas of your company. 5:30-7:30 p.m., Marriott Salon D. CI Division Open House. Listen to fast paced Pecha Kucha presentations among 6 juried competitors. Winner gets an iPad 2! 10-11:30 p.m., Marriott Salon B. The Intelligence Café Join 10 CI experts in interactive sessions to learn several CI topics in an informal setting. Noon-1:30 p.m.: Convention Center 203A, Scott Brown-Social Information Group & Joe Murphy-Yale University 60 Apps in 60 Minutes especially for iPhone, iPad and Android! Bring Your Lunch and Learn! 2-3:30 p.m.: Convention Center Ballroom AB. Seena Sharp: Sharp Market Intelligence Extreme Makeover: CI Edition—Spotlight & Need to Know Session. How to minimize risk, avoid surprises and grow your business. Tippers from Seena’s Competitive Intelligence Advantage book on how CI makes money or saves money every time! 4-5:30 p.m.: Booth 411. Book Signing by Seena Sharp. 6:30 – 8 p.m.: Meet in Philadelphia Marriott lobby. No Host Competitive Intelligence Dinner. Sign‐up for the dinner during the CID Open House (June 13 5:30-7:30 p.m. in the Marriott Salon D) or email Robin Swan at r6s0wan@yahoo.com. 10-11:30 p.m.: Convention Center 105B. Integrating with Sales & Marketing to Capture & Deliver Intelligence Learn how to gain and provide competitive intelligence for Sales & Marketing in your company. Panel discussion. Informal venue: Q&A format. No PowerPoint. June 13: Dr. Craig Fleisher: Business & Competitive Analysis—Noon-1 p.m.
June 14: Seena Sharp: Competitive Intelligence Advantage—4-5:30 p.m.
June 14: Marcy Phelps: Research on Main Street—4:30-5:15 p.m. Competitive Intelligence has historically focused on strategic and tactical forms of intelligence. In fact, SCIP changed its acronym from Society of Competitive Intelligence Professionals to Strategic and Competitive Intelligence Professionals. While competitive intelligence is an important component in strategic planning, and companies benefit from scenario planning: many companies miss the boat by not conducting and communicating competitive intelligence in real-time. Real-time competitive intelligence deserves to be a focus within the profession. That’s the point: many in competitive intelligence sit on the knowledge they gain from monitoring the environment. I think part of the reason is that competitive intelligence is a staff job, and many in the profession don’t have the authority to take action. Some corporate cultures reward information hoarding, the exact opposite of sharing and taking action. However, competitive intelligence managers can inform our company employees in real-time, and in areas where we have more knowledge, we can make recommendations. The balancing act in our job is to offer cooperative intelligence: don’t inundate people with too much information, just what you know is important to them. When you read a rumor about a competitor or marketing trend that could significantly impact your company, check it out right away. This usually involves talking to another human being. That’s why having a deep human source network is essential for every competitive intelligence practitioner. When you’re at a trade show, report back your findings several times during the day to the sources in your company who are asking. Invariably your findings bring up more questions. It’s interesting that Sales will quickly follow up with leads immediately after a conference or trade show. With the same exuberance, you need to fire off a report of your key findings to those who need to know, and those you suspect should know. Don’t put it off: some of the most timely intelligence comes from trade show interviews. What I really like is that much of this is not published yet, and can be used to give your company’s marketing, sales and product teams a leg up. When you hear that a competitor is merging or acquiring another company, put the word out immediately at your company, especially to sales people, as they can reassure your customers that your good service will continue, and perhaps instill doubt about the merged competitor entity. The point is those companies that take action more immediately are the winners these days. Those that ignore events or sit on valuable information lose. 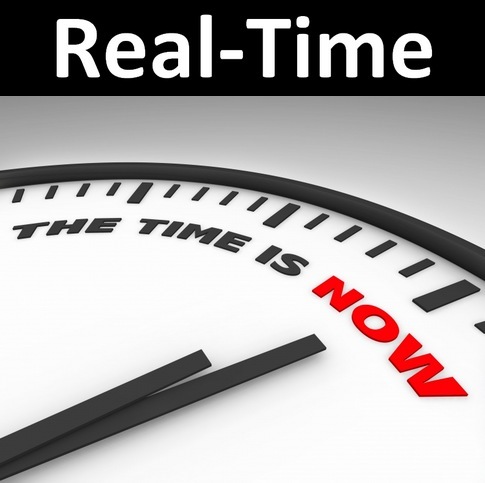 What has been your experience with real-time competitive intelligence?